The following is a list of rulers of Sardinia, in particular, of the monarchs of the Kingdom of Sardinia and Corsica from 1323 and then of the Kingdom of Sardinia from 1479 to 1861. Owing to the absence of written sources, little is known of the history of the Nuraghic civilization which constructed impressive megalithic structures between the 18th and the 12th centuries BCE. The first accounts of Sardinia are from Greek sources, but relate more to myth than to historical reality; an African or Iberian hero, Norax, named the city of Nora; Sardo, a son of Hercules, gave the island its name; one of his nephews, Iolaus, founded the city of Olbia. Greek colonization of the city of Olbia has been confirmed by recent archaeological excavations. Towards the end of the 6th century BC, Sardinia was conquered by the Carthaginians and in 238 BC it was occupied by the Romans for c.1000 years, with a period under the dominion of the Vandals in the 5th and 6th centuries CE. 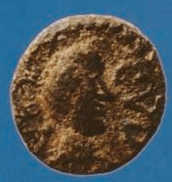 Vandal coin found in Sardinia depicting Godas. Latin legend : REX CVDA. According to Procopius, Godas was a Vandal governor of Sardinia who rebelled against his king, Gelimer, who ruled northern Africa and Sardinia. Procopius wrote that Godas behaved like a king, but it was a short-lived kingdom. Godas was defeated and killed after two years by an expedition from Carthage led by King Gelimer's brother, Tzazo. Shortly afterwards, Roman troops sent by Emperor Justinianus and led by General Belisarius, totally annihilated the Vandal kingdom and Sardinia returned to Roman administration. Before the Kingdom of Sardinia was founded, the rulers of the island were known as archons (ἄρχοντες in Greek) or judges (iudices in Latin, judices in Sardinian, giudici in Italian). The island was organized into one "judicatus" from the 9th century. After the Muslim conquest of Sicily in the 9th century, the Byzantines (who ruled Sardinia) could no longer defend their isolated far western province. In all likelihood a local noble family came to power, still identifying themselves as vassals of the Byzantines but in reality independent since communication with Constantinople was very difficult. Of those rulers, only two names are known: Salusios (Σαλούσιος) and the protospatharios Turcoturios (Tουρκοτούριος), who probably reigned some time in the 10th and 11th centuries. They were still closely linked to the Byzantines, both by a pact of ancient vassalage and culturally, with the use of the Greek language (in a country of the Romance language) and Byzantine art. In the early 11th century, Muslims based in Spain attempted to conquer the island. The only records of that war are from Pisan and Genoese chronicles. The Christians won but afterwards the previous Sardinian kingdom had been undermined and was divided into four small judicati: Cagliari (Calari), Arborea (Arbaree), Gallura, Torres or Logudoro. 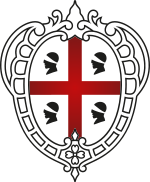 Attributed Coat of Arms of Enzo of Sardinia, according to Matthew Paris. Enzo of Logudoro Hohenstaufen, 1238–1245, was the illegitimate son of Emperor Frederick II and was appointed by his father. In 1249, he was captured by his enemies and imprisoned in Bologna, where he died 26 years later. None of these rulers had effective authority over the whole island. In 1269, an anti-imperial faction in Logudoro elected Philip of Sicily as king of all Sardinia, but this was never confirmed by the emperor or the pope and Philip never visited the island. James II of Aragon received royal investiture from Pope Boniface VIII in 1297 as Rex Sardiniae et Corsicae. The Aragonese did not take possession of the island until 1323, after a victorious military campaign against the Pisans. However, the Sardinian royal title did not have a specific line of succession and all kings used their own primary title. Between 1410 and 1412 there was an interregnum. Sardinia was taken over by Habsburg troops in 1708 during the War of the Spanish Succession in the name of the Habsburg claimant to the Spanish throne, "Charles III". At the end of the war, Sardinia remained in Charles' possession and, by the Treaty of Rastatt, was ceded to him. Spanish forces invaded the kingdom in 1717 during the War of the Quadruple Alliance. The island was under Spanish military occupation until 1720, when it was given back to Emperor Charles VI who in turn ceded it to the Duke of Savoy by the Treaty of The Hague. 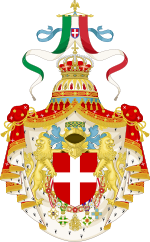 The monarchs of the House of Savoy ruled from their mainland capital of Turin, but styled themselves primarily with the royal title of Sardinia as superior to their original lesser dignity as Dukes of Savoy. However, their numeral order continued the Savoyard list. In 1861, after the annexation of all the others states of the Italian peninsula, the parliament of the Kingdom of Sardinia passed a bill (Legge N° 4671 of 17 marzo 1861) changing the name of the state to the Kingdom of Italy. The Kings of Italy retained the title King of Sardinia until the dissolution of the monarchy in 1946. The Kingdom of Italy was abolished by a constitutional referendum on 2 June 1946 and the Italian Republic was established. (The region of Sardinia itself voted for the continuation of the monarchy with 60.9% majority). Coats of arms of the Kingdom of Italy between 1890–1929 and 1943–1946. Since 1949, Sardinia has been an Autonomous Region of the Italian Republic. Its statute is a constitutional law of the Italian State and is, therefore, an integral part of the Constitution of the Italian Republic. ^ F. Pinna (2010), "Le testimonianze archeologiche relative ai rapporti tra gli arabi e la Sardegna nel medioevo", Rivista dell'Istituto di storia dell'Europa mediterranea, Consiglio Nazionale delle Ricerche, 4.